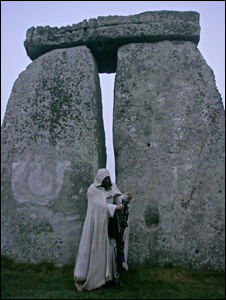 Druid Protester King Arthur Pendragon granted Stonehenge ‘pay to pray’ court date. Senior druid Arthur Pendragon has been told he can take English Heritage to court to challenge “pay to pray” car parking charges at Stonehenge. King Arthur Pendragon believes the £15 parking fee at Stonehenge was “an illegal charge” A senior druid has been told he can take English Heritage to court to challenge “pay to pray” car parking charges at Stonehenge. King Arthur Pendragon argued a parking fee of £15 for the 2016 summer solstice breached his human rights. Parking at the Neolithic monument, managed by English Heritage (EH), usually costs £5. A judge at Salisbury County Court granted Mr Pendragon a full hearing at a small claims court. Mr Pendragon asked that the date for the full hearing does not clash with the spring or summer solstice.